About Me: Laura creates art from a place of joy from within. She's an award winning advertising art director, published illustrator, and has taught art for many rewarding years to elementary grade students. Laura also sells her fine art paintings to avid art collectors. Hopefully you will find the perfect card to send to that special someone. Special thanks to all who have already purchased. Feel free to contact Laura here or at laura@laurajholmanart.com. Visit her website at LauraJHolmanArt.com to see more of her creations. All images are original art created and designed by Laura J. Holman © 2018 reproduced here on GCU as greeting cards. All Rights Reserved. Not Part of Public Domain. Welcome to Laura's card store here on GCU where many of her original art and designs are available printed as cards. 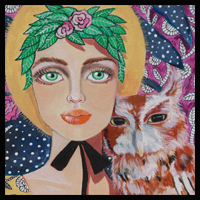 All of Laura's original art is created in traditional mediums. You will be pleased with the exceptional printed card quality. The message in every card is customizable, and at times the cover is customizable as well where indicated. You may leave the message inside as is, or be creative and express yourself! Bee-yoo-tee-ful cards, Laura. I am a fan. I love your art style! So fresh and original. Thanks for your kind card review. Keep up the good designing and I wish you many sales! Your cards are gorgeous, creative, pretty and just wonderful!! Your cards are beautiful. It creates a gentle atmosphere on your store. I especially like the pastel painted snowflakes. Lovely cards Laura, great store. Your artwork is endearing and inspiring! love your cards! This is truly one of my favorite shops here at GCU! Such lovely artwork, created with love and joy, one can just see it in every design! I love your fun and cheerful cards that look at life from a gentle and innocent viewpoint. My favorite is the dolphin - great layout and use of color and design! You are a very talented lady! Your In Kid's Pool Party Card is being featured on The World According to Ossa for July and August! Hi Laura, I love your artwork! Very elegant & professional! Your cards are all so fun, bright, and uplifting! I love your style. Good luck with sales. My husband and I have just looked over your cards and love them all!! Happy Holidays and again thank you for your great advise!!! I love your work! Your artwork is a joy and delight to view. HI Laura, nice start to your store, welcome to GCU, good luck with sales. Great designs, cute, whimsical, created with love! Love the Coton de Tulear card! What a sweet little fellow! You have a lovely start to your store Laura, your artwork makes lovely cards. All the best to you. Welcome to GCU Laura! Love your cards and artistic vision. I look forward to seeing more of your delightful designs and wish you much luck.